More Music, More Art, More Euphoria! 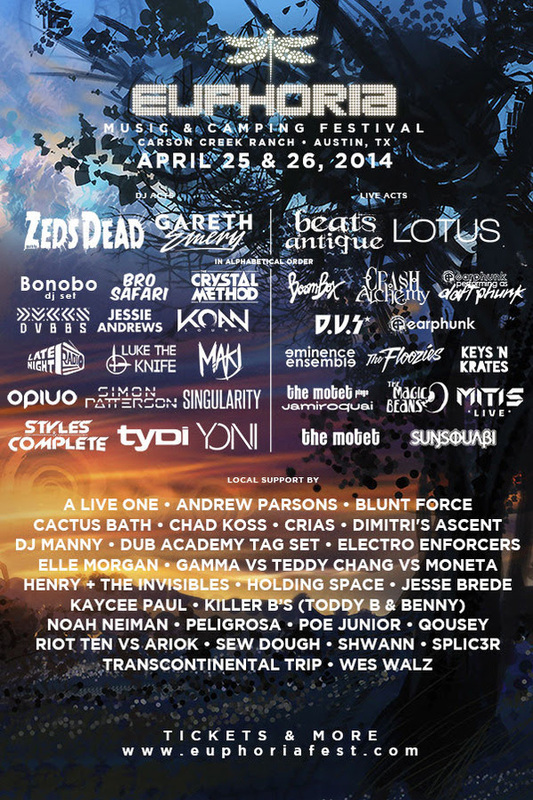 The newest artists to join the music lineup at Euphoria include: The Crystal Method, MAKJ, Opiuo, Crash Alchemy, Daft Phunk, Styles&Complete, Yoni, Earphunk and the Magic Beans. Local support is represented by: A Live One, Andrew Parsons, Blunt Force, Cactus Bath, Chad Koss, Crias, Dimitri’s Ascent, DJ Manny, Electro Enforcers, Ella Morgan, Gamma vs. Teddy Chang vs. Moneta, Henry + the Invisibles, Holding Space, Jesse Brede, Kaycee Paul, Killer B’s (Toddy B & Benny), Noah Neiman, Peligrosa, Poe Junior, Qousey, Riot Ten vs. Ariok, Sew Dough, Shwann, Splic3r, Transcontinental Trip and Wes Walz. Get a full list of all artistshere. Not to be outdone, Art also has a huge influence at this year’s festival. From a massive gallery of painters to interactive installations, Euphoria is as much about amazing sights as it is music. Check out the visual artists at the festival here.